Looking for Some Addition and Subtraction Fun to Wind Down the School Year? - Fern Smith's Classroom Ideas! Looking for Some Addition and Subtraction Fun to Wind Down the School Year? Often times, the end of the school year is the perfect time for some of my favorite themes. Testing is over, the boys and girls get the vibe that school is over, but it is not, lessons must still go on, lesson plans must still be written, the easiest way to end the school year with few discipline problems is to continue to keep your students highly engaged. Pets, Oceans, Animals, Summer, all terrific monthly or weekly themes to end your year. I have some terrific Color By Numbers, Color By Codes and Coloring Pages to keep your boys and girls busy and engaged at your centers while you continue with your small group lessons. 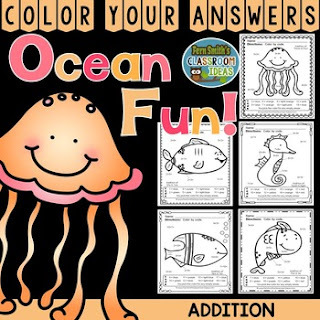 Your students will adore these TEN Ocean Animal Themed Color By Number worksheets while learning and reviewing important skills at the same time! You will love the no prep, print and go ease of these printables. As always, answer keys are included. Color By Numbers Addition and Subtraction Ocean Fun - Color By Code Printables for some Addition and Subtraction Ocean Themed Math Fun in your classroom! Each page focuses on a different addition or subtraction skill. TEN No Prep Printables that can be used for your math center, small group, RTI pull out, seat work, substitute days or homework, answer keys included too! 2. - Click Here - Color By Number Ocean Animals Subtraction. If you don't need the entire bundle, you can also purchase just addition or just subtraction resources. 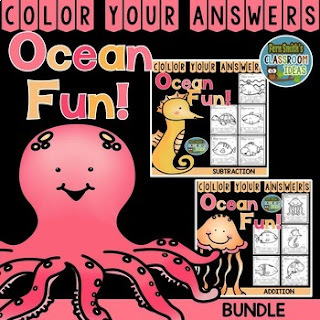 Addition Ocean Fun - FIVE Color By Numbers Printables for some Ocean Themed Math Fun in your classroom! Are you looking for a resource to excite and engage your students? Print this packet, add it to your weekly plans and you're all done. Your students will love working on these skills during seat work, bellwork, center time, small group lessons, morning work, tutoring... they are even perfect for homework! Are your parents asking for extra work for their children? Are they going on vacation and requesting a packet of work for the trip? This pack is PERFECT to help you meet all of their needs! Just print, staple and you're ready to go! Early finishers? No problem, print this packet and keep it next to your turn in basket to reward your students who love to learn! Each page focuses on a different addition skill. FIVE No Prep Printables that can be used for your math center, small group, RTI pull out, seat work, substitute days or homework, answer keys included too! 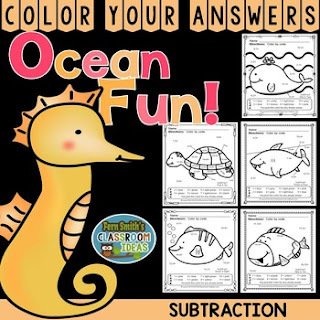 Subtraction Ocean Fun - FIVE Color By Numbers Printables for some Ocean Themed Math Fun in your classroom! Are you looking for a resource to excite and engage your students? Print this packet, add it to your weekly plans and you're all done. Your students will love working on these skills during seat work, bellwork, center time, small group lessons, morning work, tutoring... they are even perfect for homework! Are your parents asking for extra work for their children? Are they going on vacation and requesting a packet of work for the trip? This pack is PERFECT to help you meet all of their needs! Just print, staple and you're ready to go! Early finishers? No problem, print this packet and keep it next to your turn in basket to reward your students who love to learn! Each page focuses on a different subtraction skill. While the above resource is available with each page focusing on only two numbers, I also have it available as Mixed Addition and Mixed Subtraction pages. If you teach a younger group or have a lower lever in your classroom, I also have a similar Family Pets Coloring Pages with no math problems, just adorable coloring pages. Do Your Students Love Studying About Pets Too?